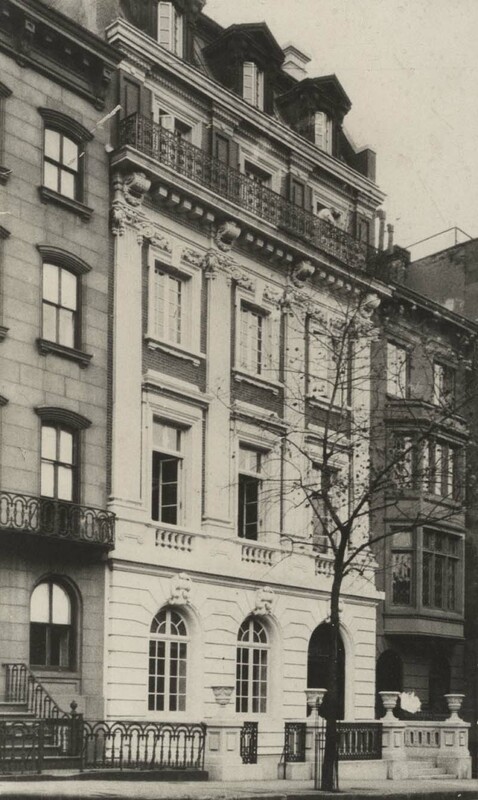 In 1901 James F. D. Lanier was a wealthy banker, a member of Winslow, Lanier & Co.; one of the oldest and most esteemed private banking firms in the country. It was that year that he and his wife, Harriet Bishop Lanier, decided to build a new home fitting their social status. 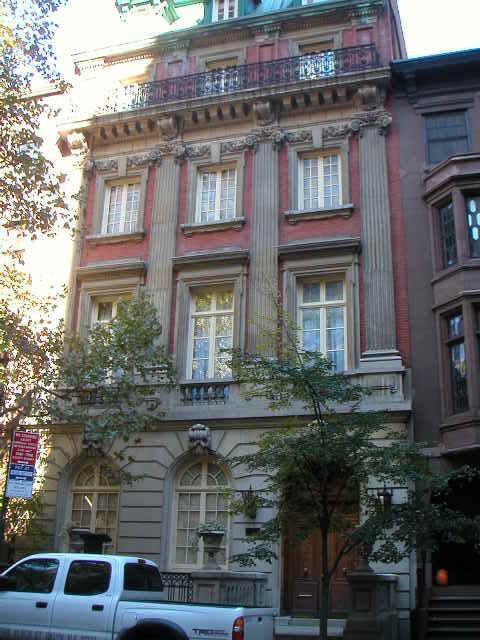 On April 10, for a total of $31,000, Lanier purchased two 1854 brownstones in the fashionable Murray Hill section of Manhattan. The banker demolished the old homes and commissioned Francis Laurens Vinton Hoppin and Terence A. Koen to design an impressive residence on the spot. Both architects had studied in Paris at the Ecole des Beaux-Arts and both had worked for McKim, Mead and White – the most distinguished architectural firm in the country at the time. Mrs. Lanier asked for something drawing on the Louis XVI style. What she got was beyond impressive. 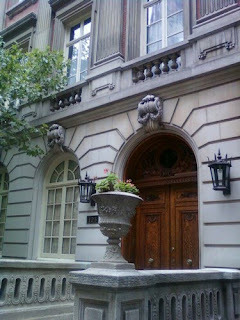 Hoppin and Koen produced a 33-foot wide Beaux-Arts mansion, completed in 1903, with a rusticated limestone base supporting two stories of red brick, the bays of which are separated by elegant stone Ionic pilasters. The fourth floor sits behind a lush cast iron balcony above a decorative cornice. The architects capped it with a copper mansard with three stylish dormers. Discarding the traditional New York City stoop, Hoppin and Koen drew from the Regency rowhouses of London or the similar LaGrange Terrace on Lafayette Street of the same period – giving the Laniers a shallow porch, three steps up from the sidewalk, flanked by heavy limestone piers topped with stone urns. Life at 123 East 35th Street was not without stife for the Shonts. Friends told that Theodore Shonts confided that “his wife brought him to the verge of ruin by her extravagance, causing him great worry and anxiety.” The couple were later separated. The Laniers eventually took back possession of their home. James Lanier died in 1928, leaving an estate of $10 million which was to go to his son, Reginald, after his mother’s death. Harriet Lanier died three years later. Reginald Lanier and his wife moved into his childhood home, maintaining its tradition as a socially prominent address. Mrs. Lanier hosted tea and cocktail parties for charities well into the 1950s. The house at No. 123 East 35th Street has been lovingly cared for for more than a century. Today the private house is indistinguishable from that in period photographs; an elegant and stately reminder of Murray Hill at the turn of the century. otally obsessed with this house. I live one block from it and walk my puppy past it four times a day! You never see anyone go in or out, but it is meticulously kept up - flowers etc. Last week they had the front door wide open while workers were painting the ceilings white. I walked up and in to get a good peek inside.. It was a huge ornate room with only huge white statues - reminiscent of the Bacchanal era - on all sides of the room and it was quite unusual white-on-white. Incredible molding. Rumor has it a Sheikh lives there and it's his "party" house.